It is barely a year and a half since the South African police gunned down 34 striking miners at Lonmin’s Marikana platinum mine on 16 August 2012, yet far from being cowed by this butchery the South African workers have continued a determined fight for their interests. There have been strikes in gold, platinum and coal mines over redundancies and shaft closures, a 4 week strike in the auto industry during October, and in January the platinum miners came out again. The same workers who saw their comrades massacred in 2012 are today on strike for the same demand! 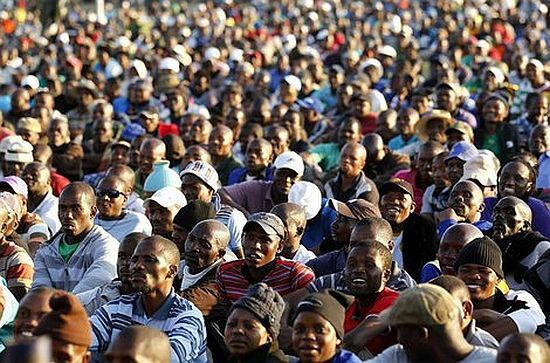 80,000 miners, including those from Marikana, came out on 23 January, again demanding a starting wage of R12,500 (£700) per month and at the time of writing attempts to reach a settlement have collapsed. This strike, however, is different from that of 2012 in a number of ways. On the positive side, the strike is more widespread and affects all 3 major platinum miners, Anglo-American platinum (Amplats), Impala and Lonmin. This is the first time the 3 major mining houses have ever faced a combined strike. The strike is, therefore potentially more damaging as it affects at least 40% of the global output of platinum. In addition the metal workers, who process the ore, have joined the strike at Amplats. However on the negative side the strike is official, or what is called “protected,” which means the officially recognised union has organised it, going through all the mechanisms of conciliation, arbitration and delaying periods, thereby giving the bosses at least a month’s prior notice. This has given the mine owners a long time to prepare for the strike. They have done this by building up stocks of ore and refined platinum and, according to the Financial Times, will be able to fulfil their contractual deliveries to buyers until the end of March for international contracts and the end of April for South African ones. This preparation has meant that the strike is also costing the mining houses much less in lost production than the 2012 strikes, which were all wildcats. In 2012 the strikes resulted in 895,000 ounces of platinum production lost whereas today after 8 weeks of strike the figure is approximately 350,000 oz. The conditions under which the miners work can only be described as wretched. They are exposed to rock falls, dust, fumes, noise and extreme heat. Even the SA Minister of Industry, Bob Davies himself, described these conditions as “appalling.” The present strike demand for R12,500 (£700) per month at entry level is the same as that demanded in the 2012 strikes. The 2012 strikes were settled with a 22% pay increase which still left the entry level pay at R6,100. The present demand, which represents a doubling of the entry wage, even if achieved, would still leave the miners being paid only about 60% of the UK minimum wage. The present wage amounts to approximately £2 per hour for a 45 hour week! Because of the high unemployment in SA a typical miner has approximately 8 people depending on his wage which gives an indication of the desperate situation miners and their families face and why they are prepared to face a murderous police force. The mine owners have offered R9,390 (£523) per month and say they cannot afford more than this. The miners’ union, the Association for Mineworkers and Construction Union (AMCU) which was demanding the payment of R12,500 immediately softened its position in the negotiations to having the pay increase made over a 3 year period. The mine owners flatly rejected this and consequently attempts by the Commission for Conciliation, Mediation and Arbitration (CCMA), to broker a settlement collapsed in early March and the strike continues. The mine owners are in a stronger position than they were in 2012. Not only has the price of platinum increased by 6% but the fall the value of the Rand has boosted profitability. According to the Financial Times profitability of platinum mining is still 9%, though it was much higher, approximately 33%, in the decade to 2009. The value of the Rand against the dollar has fallen by 30% since 2012, and because platinum is sold in dollars, this means the costs in SA, which include the cost of miners’ wages, have also fallen by 30%. In addition the owners have reduced the workforce by closing unprofitable shafts and introducing more capital equipment. Employment in platinum mining has fallen from 145,000 at the end of 2011 to 134,000 in December 2013. In the longer term there are plans to move from deep mining, which requires a lot of labour, to shallower open cast mining which is much less labour intensive. SA capital is doing what capital does worldwide, replacing living labour with dead labour in an attempt to boost profitability. Though this may work for the individual enterprise for a short period, for the capitalist system as a whole this will eventually decrease profitability since the exploitation of living labour is capital’s only source of profit. The figures which the bourgeoisie use to describe the health of an economy show SA capitalism to be in a fairly anaemic state. Growth for 2014 is predicted at 2.8% which is only slightly more than the official rate of population growth (1.34%). The budget deficit 6.8%, inflation 6.3%, official unemployment 25%, though what is called the expanded rate which includes those out of work who have given up looking for work is 36%, and youth unemployment, which includes those between the ages of 15 and 34, is 70%. As mentioned above the currency has fallen 30% against the dollar in the last 18 months pushing up the cost of imported goods and storing up a burst of future inflation which will, of course, reduce living standards of the working class. Despite the relative decline in the importance of mining during the last 3 decades, the industry remains a very important one for the SA economy. It contributes 5% directly to the GDP and once the associated industries are added in this figure rises to 20%. Mining employs 500,000 workers directly and a further 830,000 indirectly, and contributes 38% of the country’s merchandise exports. Platinum is the country’s second largest foreign exchange earner. The strike is therefore a severe threat to SA capital and the ANC regime which acts as capital’s executive. The strike is, however, part of the longer term struggle of labour against capital which is now threatening to unpick the stitches holding together the tripartite alliance, the organisation set up to control SA capitalism following majority rule in 1994. 30 days must have elapsed since the referral to the CCMA before a strike can take place. The employer must then be given written notice of intention to strike at least 48 hours before the strike starts. The National Union of Miners (NUM) was the main mining union and was once the largest union in COSATU. As explained in our text on the Marikana Massacre this union has negotiated miserable pay increases and tried to enforce them on increasingly rebellious miners. Its leaders have been attacked and needed police protection when trying to persuade miners to accept the wretched conditions and pay which SA capitalism imposes on them. The union has also been the vehicle through which leading ANC figures have risen to become multimillionaires, the most notorious figure to have taken this path is Cyril Ramaphosa who now personally owns 9% of the Lonmin. The strikes in 2012 were wildcat strikes and completely bypassed both the NUM and all this machinery for delaying and controlling struggle. They were thus a real threat to SA capital. This is why the regime had no hesitation in butchering striking miners at Lonmin’s Marikana mine in August 2012. This was a massacre which was clearly supported by the ANC and leading ANC millionaires like Ramaphosa, who, we note in passing, has, since the massacre, been promoted to deputy president of the ANC. It is also worth noting that neither the ANC nor the NUM deigned to attend the memorial ceremony for the slain miners on the first anniversary last August. In the period since the massacre, miners have channelled their frustrations into an alternative union, leaving the NUM and joining the AMCU. In the 3 major platinum mining houses the AMCU membership has grown until they are now the major union with more than 50% of the workers affiliated. The AMCU is consequently the officially recognised union and has organised the present strike through the official channels set out in the “Labour Relations Act” mentioned above. Consequently the strike is a “protected” strike, which means, in theory, that the bosses cannot sack or victimise the strikers, but it also means that the bosses have plenty of time to prepare to defeat it. Although it is a “protected” strike this has also not stopped the mine owners from using the courts to try and end the strike and bankrupt the union. Amplats, for example, has launched a R591M (£33M) lawsuit against AMCU for criminal damage, intimidation and keeping non-striking workers from working, and according to the boss of Amplats, Chris Griffith, they are considering court action to get the entire strike declared illegal. We now see the AMCU taking up this role. However, what is necessary is to oppose the entire capitalist system and lead the class struggle in this direction of its overthrow. The development of the South African class struggle is exposing the real fault lines in SA society as those between workers and capital. An atrocity such as Marikana cannot simply be brushed under the carpet by the ANC and its cohorts in the tripartite alliance. It shows the bourgeois nature of the ANC to anyone with their eyes open. It is not surprising therefore that splinter groupings are coming out of the ANC and COSATU claiming they have betrayed the workers. A recent split from the ANC is the “Economic Freedom Fighters” formed in 2013 and led by the expelled ANC youth leader Julius Malema, who modestly calls himself “commander in chief.” This group demands nationalisation of the mines and land, as called for in the ANC’s “Freedom Charter.” Although the ANC may brush aside Malema as a corrupt populist, the issue of the Freedom Charter and ANC betrayal are not so easily sidestepped. These issues find a wide audience. A further significant challenge to the regime springs from attacks on COSATU and the famous tripartite alliance. Some unions such as the AMCU have not affiliated to COSATU and are under no obligation to abide by the dictates of this alliance which generally entail ending strikes. Now, however, some unions within COSATU are starting to rebel. In particular the National Union of Metal Workers of SA (NUMSA) the biggest union in COSATU, is engaged in a furious row with the COSATU leadership. As mentioned above this union joined the platinum miners in their strike, and has also declared it will not support the ANC in the May elections nor fund the ANC’s campaign. It is now under threat of expulsion from COSATU for the “crime” of wanting to destroy the ANC, SACP, COSATU alliance. NUMUSA is fighting against its expulsion from COSATU and its plans for a united front of leftist organisations are somewhat ambiguous. It still appears to believe that pressure on the ANC regime can force it to deliver better pay and conditions for workers. What these developments do, however, show is that the entire system of management of SA capital which has been in place since 1994 is being eroded and may fall apart in the coming period. Nationalisation is not Socialism and will not benefit workers. What Malema and others like him are claiming is that the South African state, which he himself admits is controlled by a gang of criminals, could manage capitalism better than the present mine owners. He therefore tells workers they should struggle to exchange the present bosses for this pack of thieves. This is a great diversion which can only direct the miners’ struggle into paths which will benefit elements of the state bureaucracy rather than the miners themselves. History illustrates the futility of such a struggle. In the UK, for example, all mining was nationalised after the Second World War and the state, as employer, instituted rationalisations, speedups and redundancies. The number of miners was reduced from 718,000 in 1947 to under 10,000 by the turn of the century and the profitable mines were handed back to private capitalists in the late 80’s. Throughout this process the state acted in the interests of capital, that is, in the interests of the exploiting class, against the interests of the workers. A further example is that of the Soviet Union where all capital became the property of the state after 1928 and a thoroughgoing system of state capitalism was introduced which lasted until 1989. During this period the savage exploitation of Russian workers was carried out under a smokescreen of propaganda claiming that they owned the means of production, that their interests were in supporting the state, in increasing production, in making sacrifices and that their lives would soon get better. All of this was a pack of lies. After 1989 the means of production, which the workers supposedly owned, were shared out among state functionaries and their favourites. Workers’ ownership was complete fiction. One thing which Arvin Jim of NUMSA said is, however, quite right. The working class needs to organise itself as a class for itself. What this means is that it needs to give itself a political organisation which fights, not simply for crumbs from capital’s table, but for the real interests of workers worldwide namely the overthrow of capitalism as the global system of production and its replacement by socialism. What is needed is an internationalist political organisation of the working class to fight for this. An official of AMCU was killed by police at an Amplats mine during the strike. Elsewhere police have recently shot 7 people dead in various protests over lack of drinking water. In one of these a protester Andries Tatane was killed in broad daylight in front of a crowd of several thousand. The police fulfil their real role in maintaining capitalist order in whatever way they feel is necessary. See reuters.com The SA constitution, of course guarantees the right to strike. Workers’ rights, as in all capitalist countries, remain only on paper. The Freedom Charter was adopted as ANC policy in 1956. It contains state capitalist demands such as nationalisations. ANC leaders agreed to drop this policy as a price for ending apartheid and instituting majority rule in the early 1990s.